These Dairy-Free Garlic Mashed Potatoes are creamy, loaded with flavor, and made with no cream or butter. Tender potatoes are whipped to perfection and then sprinkled with seasonings and ready to serve. Easy to make and with simple ingredients, you’ll never miss the dairy in this tasty side dish! So, tell me…do you follow a certain diet? Kind of stick to a diet-ish plan? Or just eat whatever? I’m thinking that if you’re following along here, then you’re not super health-conscious because I’m not a health-food blogger by any means. Everything in moderation, right? I don’t follow a vegan, gluten-free, low carb diet, etc. (ummm hello pasta and desserts! ), but I have had to watch my dairy intake lately. I don’t usually consume dairy on a daily basis, but sometimes when I do, I get an upset stomach. And while it’s not too often, I’ve been thinking about using less dairy and more plant based choices. And that’s where Silk comes into play. It’s dairy-free and lactose-free and is a great way to get your nutrition. Working on your health can be hard, but feeling healthier doesn’t have to be. Silk’s Progress is Perfection campaign fights the idea that ‘extreme’ is the only way to leading a healthier life. And by using less dairy and more plants, Silk is great for creating lightened-up versions of your favorite recipes to help with small victories on your path to a better you. Want to learn more about Silk? Head over to this page and Walmart to find more information. You can also check out this Ibotta offer for a coupon. 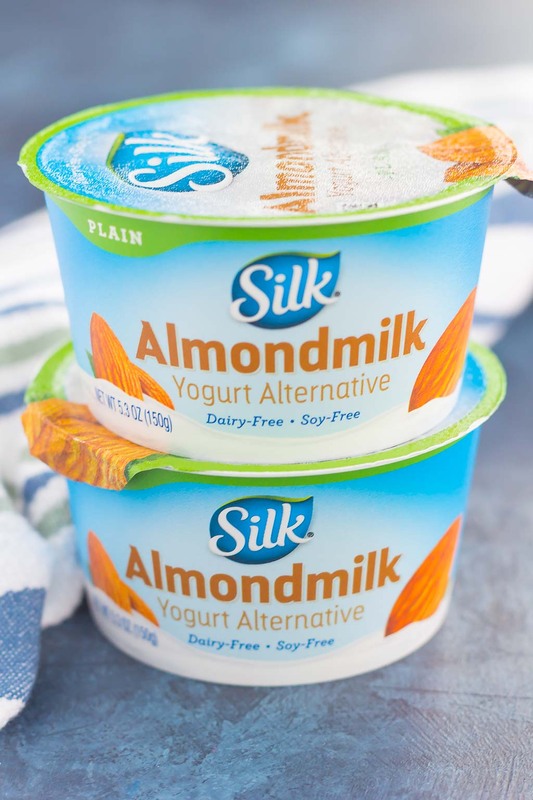 So when I was at Walmart last week, I picked up Silk Unsweetened Almondmilk and Silk Plain Almond Dairy-Free Yogurt Alternative. 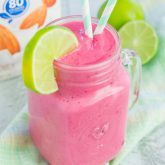 I love the smooth and creamy taste of these products and knew it would be a star component in some tasty recipes. 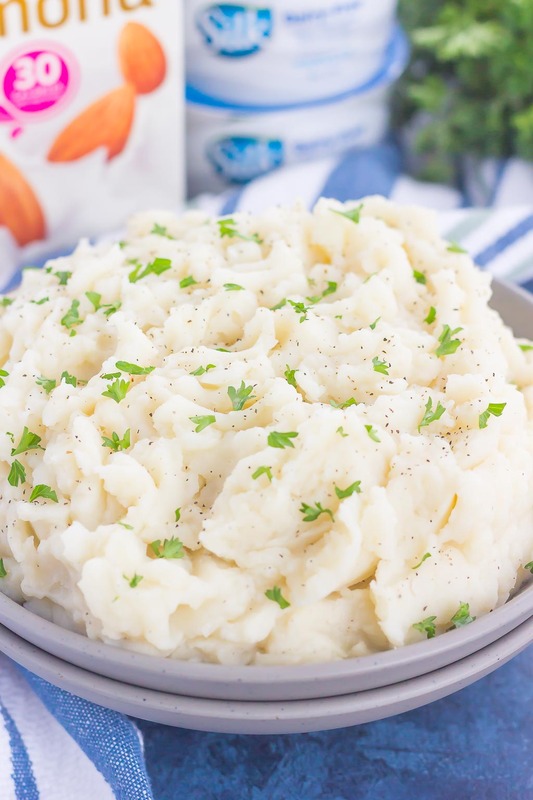 I don’t know about you, but mashed potatoes are one of my favorite side dishes. It’s warm, hearty, comforting and just all-around delicious. 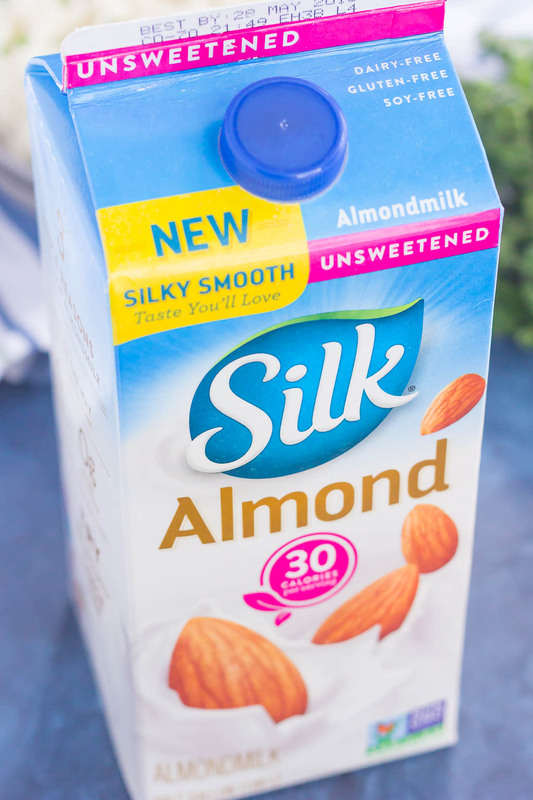 So when I was able to use Silk Unsweetened Almondmilk to make this recipe, I knew I had a meal-time winner. Now, it may sound strange to use no milk, butter or cream in these Dairy-Free Garlic Mashed Potatoes, but trust me, you’ll never miss it! The hubster loved these (in fact, he ate most of them himself!) and that’s saying a lot. 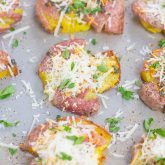 The hint of garlic and the Silk Unsweetened Almondmilk give these potatoes the creamy texture and flavor that is out-of-this-world delicious. And like most of my recipes, this dish was a breeze to whip up. The hardest part was peeling the potatoes. But, if you’re like me, you can get your husband to do the hard part. After the potatoes are peeled and quartered, add them to a large pot and cover with water. Bring the potatoes to a boil, then lower the heat and cook until the potatoes are fork tender, about 20-25 minutes. After the potatoes are ready, drain the water and then add the Silk Unsweetened Almondmilk and start mashing. I used an electric hand mixer for ease, but feel free to use a potato masher. Add about 1/2 cup of the almondmilk at a time to reach your desired consistency. When the potatoes are whipped, add in the garlic powder, salt, and pepper and taste. If needed, add more seasoning. I used garlic powder for overall ease in this recipe. However, if you have more time, you could roast your own garlic, add in garlic cloves, or even minced garlic. But, since I’m all about the easy recipes, garlic powder was my seasoning of choice. And that’s it! 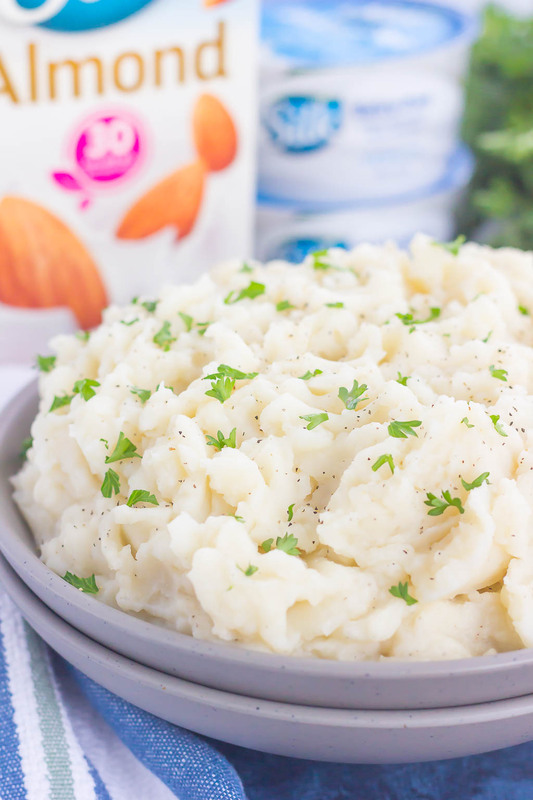 These Dairy-Free Garlic Mashed Potatoes are packed with flavor, extra creamy, and taste like pure comfort food. I guarantee you’ll never miss the dairy in this delicious side dish! These Dairy-Free Garlic Mashed Potatoes are creamy, loaded with flavor, and made with no cream or butter. Tender potatoes are whipped to perfection and then sprinkled with seasonings and ready to serve. Easy to make and with simple ingredients, you'll never miss the dairy in this tasty side dish! Place potatoes into a large pot and fill with enough water to cover potatoes. Bring potatoes to a boil, then reduce heat to low, cover, and cook for about 20-25 minutes, or until potatoes are fork tender. Remove from heat and drain water from pot. 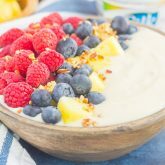 Add Silk Unsweetened Almondmilk, 1/2 cup at a time, and mash using an electric hand mixer or potato masher, until potatoes reach your desired consistency (I used about 1 1/2 cups of Silk Unsweetened Almondmilk). Stir in garlic powder, salt, and pepper. Taste and add more seasonings, if necessary. Want to see more? Head over to your nearest Walmart to check out their selection of Silk products. You can also follow Silk on Facebook, Twitter, YouTube, Pinterest, and Instagram. I'm trying to eat less dairy so Silk is always in my fridge. I actually prefer it to milk now! I haven't used it in mashed potatoes yet but need to try it. 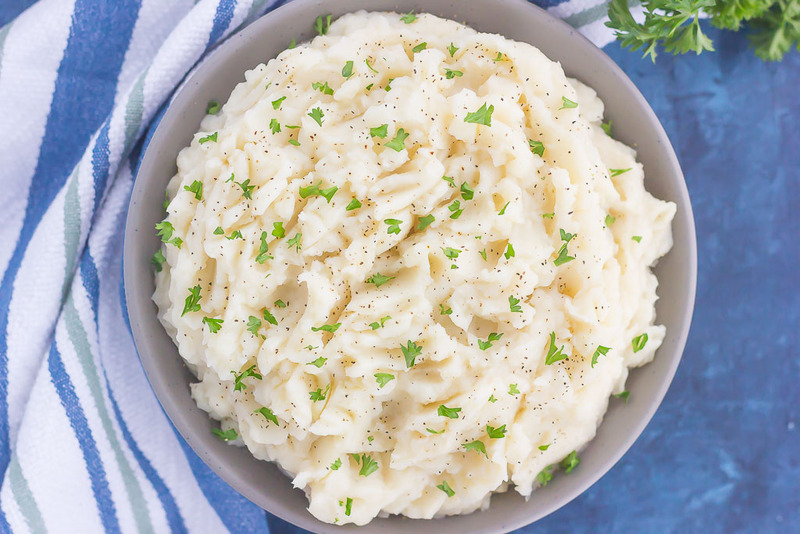 These mashed potatoes look so perfectly creamy and fluffy and I love that they're healthier! Thanks, Marcie! I've been hooked on Silk lately! Oh gosh, only FIVE ingredients for these gorgeous mashed potatoes?? I'm all in. They look SO amazingly creamy for being dairy-free! these mashed potatoes look so cream Gayle!Yum! I love Silk! 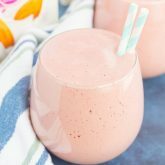 It is so much better than regular milk, less calories, too! 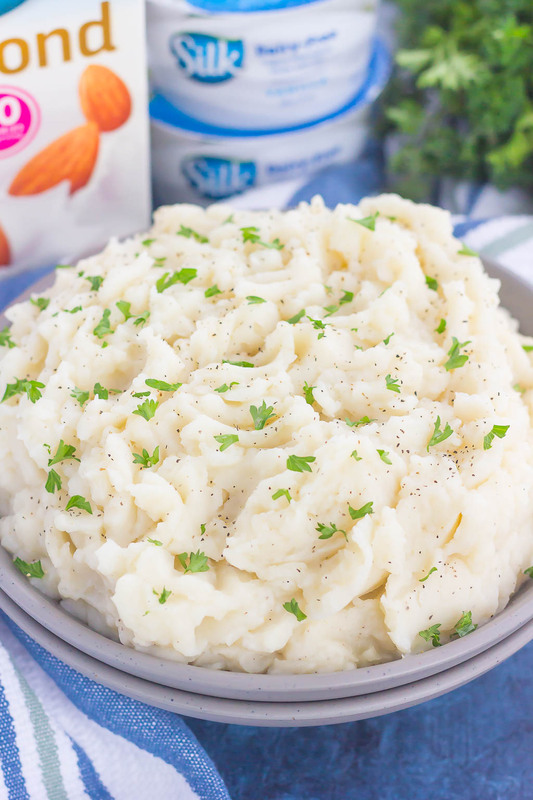 These mashed potatoes look amazing! I can have the whole bowl for dinner! I love your thinking! Thanks, Mira! Im making this for my fish pie!!! Thanks for the idea. Love that you used Silk instead of Dairy! Such a great option :) They look like a perfect bowl of mashed potatoes and love the garlic, a necessity for me! Haha! Isn't garlic the best? Thanks, Elizabeth!